Dinesh Subedi/Republica A church built recently through donations and labor contribution from devotees in Kareti village, Rolpa in this recent picture. ROLPA, June 13: Jagu Gharti, 78, describes himself as not a very devout Hindu. However, he is familiar with other people's faith and culture in his village. Most of them embraced Hindu values and culture. During the time of conflict, he noticed something different. The then rebels, Maoists, had 'restricted' people to follow any religion. Maoists would hate to see people showing devotion to deities or clinging to any faith. "If we were found to have performed any sort of pooja, they would confront us and threaten us. They punished many villagers for performing pooja for going against their dictates," he said. "They reigned here, no other government existed," he reminisced. Maoists wanted to spread a belief that worshipping unseen powers was foolish and a cause of several social ills and discrimination. Gharti would always try to figure out why they were so much against religion. On the other hand, he had also observed people's strong connection to religious values and cultures. However, presently he is spotting some chances in the society, which he feels are strange. Some of the people who used protest against religion have now turned into devout Christian. "Maoist guerrillas used to punish us for following religion during the conflict. But currently they themselves attend congregation in churches. It is unbelievable," Gharti said. Gharti, local of Triveni village reported that some of the former Maoist cadres go to Church every Saturday. They hardly miss any of the programs at the church. "I do not understand why they are forgetting our old religion and traditions. What they are up to, I have no idea. Let alone going to church for worshipping, they take even patients to church instead of hospital," he said. Gharti believes that patients should be taken either to doctors or to shamans. "But you see, all the people here are thronging to the church. They have gone mad. They say Prabhu will cure all disease. Now, you say, how will it work?" he wondered. "We are presently witnessing drama that you won't find elsewhere. They are now loving God, they are now loving alcohol. What a new era has arrived! "he said sarcastically. It is not only Gharti, who has noted growing influence of Christianity and as well as liquor in Rolpa villages. Many believe that due to the lack of employment and proactive approach taken by Christian organizations, there has been growing adoption of Christianity in the district. "People have multiple problems. There is no work. So, you easily get into wrong habits," noted Bikash Ale, another local of Triveni village said. "And then, there are Christian organizations which lure you to that religion," he added. According to Ale, two types of people are converting to Christianity. "One of these are people who believe that their poverty will come to an end due to the new religion and other are those who are fed up with the caste issues in Hinduism. However, most of them convert because of both factors," he said. Ale also shared concerns on health related issues. People visiting church even for treatment, is something weird, he commented. "Such activities are taking toll on people's health. Instead of going to health post, they go to mandali in Church," said Ale. In-charge of Kareti Health Post, Bishal Gharti agrees. Patients he referred to hospital do not go to hospital. They go to church, he said. "And when their condition does not get better there, they come back to us. But by that time, case worsens," he lamented. Locals have constructed a church by raising fund and donating labor. There are many such houses made by the 'devotees', Bishal informed. 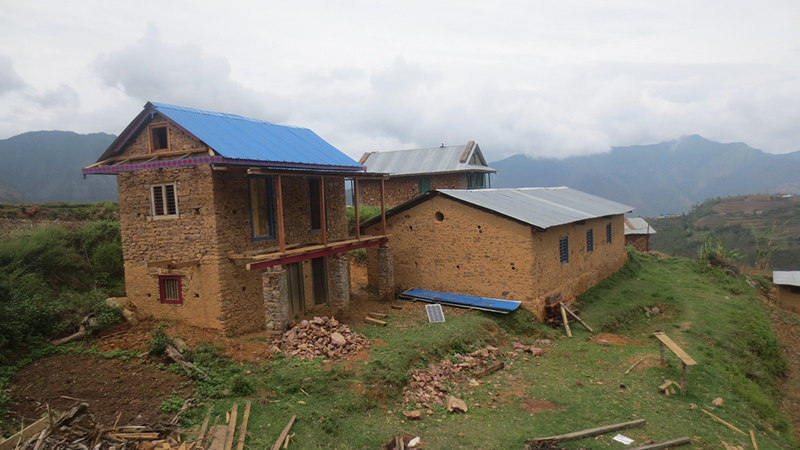 He estimates there are over five dozen of churches in Rolpa. "We have so many churches in our district. But we don't have enough schools, hospitals etc," Bishal remarked.